Last weekend I was lucky enough to get to go to the Supernatural (SPN) convention in Jacksonville, FL! In addition to the excitement of meeting the cast, it was also my first time being away from Fox for more than a few hours. He’s nearly 4 now, so this was the first time in about 4 years I’ve had more than a few hours to myself. It was definitely time, but still took a lot of planning and support. I got the convention tickets many months ago. It was easier to book it when I thought we’d “totally be ready by then.” I had lots of feelings, (like anxiety about being away from my little guy for so long), but excitement and the need for a break won out. Dadu and Foxer got to have a fun guys weekend while I was away, including Fox’ first fishing trip, and Dadu got to see how much I do every day. (He sent me a text during the weekend about how they’d thought the house cleaned itself and they were very confused). My college bestie, Victoria, drove up from Ft. Myers to come with me, so it was also a BFF/girls weekend, which was long overdue. We got to meet the cast, get their autographs, attend panels, karaoke with the cast, a couple photo ops, and we got to attend the “Saturday Night Special” Louden Swain concert to raise funds for Random Act’s and Misha Collin’s school in Nicaragua. It was super inspiring to see such a talented group of creative people doing what they love and making a difference in the world while connecting and giving back so much love and respect! To have such amazing people treating me like I’m amazing, genuinely interested in what I had to say, engaged and waiting for me to say more, and thrilled by my feedback was very up-lifting. EVERYONE IS SO GENUINE. So incredibly warm and welcoming! I’d heard good things about the “SPN Family” and how amazing it was, but experiencing it first hand was truly inspiring. The love and support of everyone truly blew me away. It was astonishing how kind everyone was. So much love! The entire weekend was so well organized! Such great production value! They even had counselors with tissues waiting after the autograph and photo op lines. The pacing was good, with time for panels, breaks to rest or eat, autographs, photo ops, and time to browse the vendor room. It was cool how you could have a photo op in the morning and pick it up a couple hours later, in plenty of time to get it signed that evening! Staying in the same hotel as the convention definitely made it all easier too AND our view of the river and city of Jacksonville was stellar! The lights even blinked, (in a non-annoying way), on the ceiling during certain parts of the convention. It also was pretty awesome how they played each actor to the stage for their panel. For Julian Richings (Death) they played Don’t Fear The Reaper. For Mark Pellegrino (Lucifer) it was Runnin’ With The Devil and Mister Crowley for Mark Sheppard’s intro! The little things can be the most badass. Each member of the cast we met was so genuine, taking the time to really engage us in a little conversation and making plenty of eye contact! As we came up to get Gabe Tigerman’s autograph, he told us both that we’re beautiful! He played Andy Gallagher, who I loved, and his panel was hilarious! Matt Cohen, (Young John Winchester), drew a heart with his signature by the Impala, the car that was originally his, so appropriate. They have a theme for Karaoke night each year and, as the first SPN convention of 2017, they started their new Circus/Side Show theme at Jaxcon. Rich was the ring master, Matt was the strongman, and Alaina was the bearded lady! So much fun! The large screens on either side of the stage announced the upcoming song/singer and then displayed the lyrics for the audience to sing along. At several points throughout the night Matt Cohen, Jason Manns, and Rich came down into the crowd to take selfies with people. Of course we all sang Kansas’ Carry on My Wayward Son, among other Supernatural classics! After their turn on stage fans got hugs and selfies with the cast. I just may have to work on a song for next time. There were lots of fun costumes in the audience too, including a lion! As soon as I woke up Saturday morning and thought “what am I doing today” my stomach immediately cramped up with excitement. Meeting Castiel and Crowley, that’s what was about to happen! Victoria and I had a photo op with Misha Collins (Castiel) and Mark Sheppard (Crowley)! It was so amazing to be in their presence! Of course I love Misha as Castiel, but all the work Misha does with his charities is truly inspiring and Mark Sheppard has been in pretty much every show I love (X-Files, Firefly, Battlestar Galactica…) and is an amazing drummer! I decided to have Mark Sheppard sign our photo op rather than my poster, (which I was going to originally have everyone sign). He’s pretty much a living LEGEND so I was super excited to get to say hi and thank him for being so awesome! When it was my turn for Misha Collin’s autograph I showed him I had his keychain and he said “a constant reminder” to which I said “of a magical weekend” and he signed our photo with a heart. Such a wonderful human being (and TV angel)! As I exited the ballroom I walked by Louden Swain playing in the vendor room and snapped a photo. Afterwards they were signing their merch so I bought their newest album, No Time Like The Present, and got it signed by each of the guys, including Rob Benedict, (Chuck/God)!!! It was so thrilling to get to tell him how much I love his music (guitar and vocals), along with his work on Supernatural and Felicity. He beamed/grinned! Working my way down the table, I got to talk to each of the band members, (Guitarist Billy Moran, Bassist Michael Borja, and drummer Stephen Norton), and tell them I’d be there at the show that night! They were amazing!! Their music really resonated with me! Clever relatable lyrics, rocking guitar, bass, drums and, of course, Rob’s voice! The way it all gelled! I’m so hooked! During the Saturday Night Special concert Mark Sheppard came out and played drums on a second drum set and Rich played bass on Whipping Post! Each of the guys are so individually talented and together they just flipping ROCK! So much skill and you can tell they love it! Mike Borja laying down the groove with his bass! Billy’s guitar solos singing it out! During the song She Waits everyone had their phone flashlights on, swaying overhead and it was so beautiful I totally cried! The concert was live streamed to raise money for Misha Collins and Random Acts to build a school in Nicaragua for those who wouldn’t normally get to go to school. Jim Beaver and Mark Pellegrino, (Bobby and Lucifer), went through the crowd as ushers for the charity raffle collection from the audience. Combined with online donations, from the live stream, we raised over $70,000! Such an awesome thing to be a part of! We also got to play our kazoos during part of their song Medicated. “You are, and you can, and you do! And you impress us everyday! Thank you women of the world! The day started with the Jared and Jensen (Sam and Dean) panel for Gold pass-holders only. After an intro by Rich, Rob, and the rest of Louden Swain, Jared and Jensen ran up the center isle from the back of the ballroom to the stage! The house lights were up so they could see us and instead of having to be chosen ahead of time to get to ask them a question we could just raise our hands and they’d call on us. They were tired, (especial Jared since he’d been up filming in Toronto until the wee hours and then flew to see us), but they were both in great spirits! After the Gold J&J panel I had just enough time to hit up the bathroom and touch up my make-up before heading up the escalator for my photo op with Jensen Ackles. Everyone in line was SO excited! As I got near the front of the line one of the volunteers was recommending that we dance our way up there, to help with nerves. (That’s what I’d done as I got up to the front of the line for our Misha and Mark photo op, but it was a little harder with how much I love Dean). When it was nearly my turn, they had me wait for a couple people with crutches or canes to get their photo ops. Jensen looked my way a few times to see if I was next, so I got a few extra glances from him. I’ll never forget the way he stood there, turned to me and smiled while looking me in the eyes as I walked up for our photo! When I got close it was like looking into he sun! I asked him if I could have a hug and he scooped me right up without hesitation. He was kind and gentle, respectful and sweet, the perfect gentleman. After the photo one of the volunteers walked up to me with her clipboard and said we’d have to do a retake, since someone blinked, and guided me back around and near the front of the line. When it was my turn again I walked up to Jensen and told him I blinked in a “aww shucks” kinda way. While looking me in the eyes and smiling and he said “that’s alright” and scooped me in for a second hug! He was comforting, reassuring, and didn’t mind hugging me again at all. So sweet! 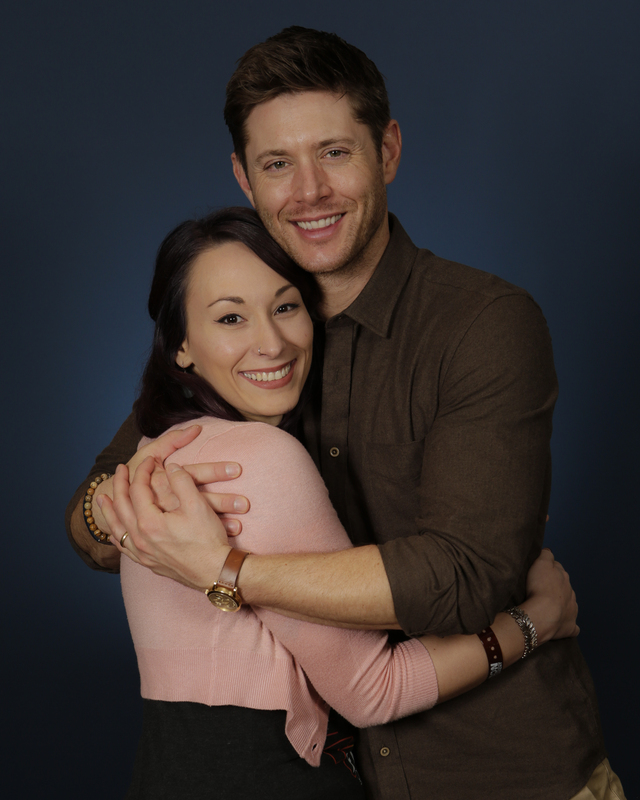 So I got to hug Dean Winchester twice! Two hugs and two photos! Even though my eyes are wonky in the first one I still have a picture of that first hug and his beaming smile! (I was happily surprised to see both photos on the photo op table later on). I went to check out the Louden Swain merch table again for a tank top. The volunteer at their table reminded me that they were signing their merch again, so I totally jumped on the opportunity to talk to Rob and the guys again! So flipping cool to get to tell Rob I loved the concert so much that when I got back to my room I put my headphones in to listen more. I just couldn’t get enough! I told him I downloaded two more albums and he asked how I got them and I told him I used iTunes on my phone. He was genuinely stoked! Loved getting to tell the rest of the band how much I enjoyed the concert, how the guitar solos really sang to me, and that I’m a musician too. Billy asked what I play and I got to tell him I play flute. Now I have two sets of Louden Swain signatures, one on their newest album and also on my tank top! We watched in awe as we got to the front of the autograph line, as Jensen winked at fans and smiled. He looked me in the eyes for moments after signing my poster and smiled his crinkly eye sweet smile at me. Now I wish I’d said something about how amazing he is, but in the moment I just wanted to look at him forever. I was wearing my “I Am Enough” tank top from Jared’s Always Keel Fighting campaign. When it was my turn for his autograph I pointed to it and said “I want to think you for this.” He looked at me to go on so I told him it has become my motto, especially as a mom. and he was like “oh yeah, moms do SO MUCH, like “you’re doing so much and it is definitely enough” It was especially reaffirming and heartening to me coming from a father. He was so genuine, engaging, and encouraging. So much like Sam in the show. Impala Poster signed (from top left around clockwise) by Matt Cohen (Young Jon Winchester), Jared Padalecki (Sam), Jensen Ackles (Dean), Mark Pellegrino (Lucifer), Richard Speight Jr (Trickster/Gabriel), Alaina Huffman (Abaddon) , Gabe Trigerman (Andy Gallagher), and Julian Richings (Death). Photo op signed by Misha Collins (Castiel) and Mark Sheppard (Crowley).